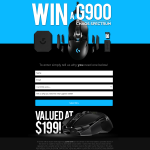 Win a Logitech G900 Chaos Spectrum! A winner will be drawn week beginning 23/05/2016 and be alerted via the email address provided above. If the winner is unable to respond to attempted contact within 1 week of the draw, the processes will be repeated until a suitable winner has been found. Scorptec reserves the right to alter the prizes in this prize pool without notice. By clicking "Submit Entry" above you agree to subscribe to the ScorpTech News database for notifications of, and access to, exclusive tech specials, new release announcements and product news. This can be unsubscribed from at any time. We live and breathe tech, we want to share it with you!